A sad but happy time for us in the shop this week. 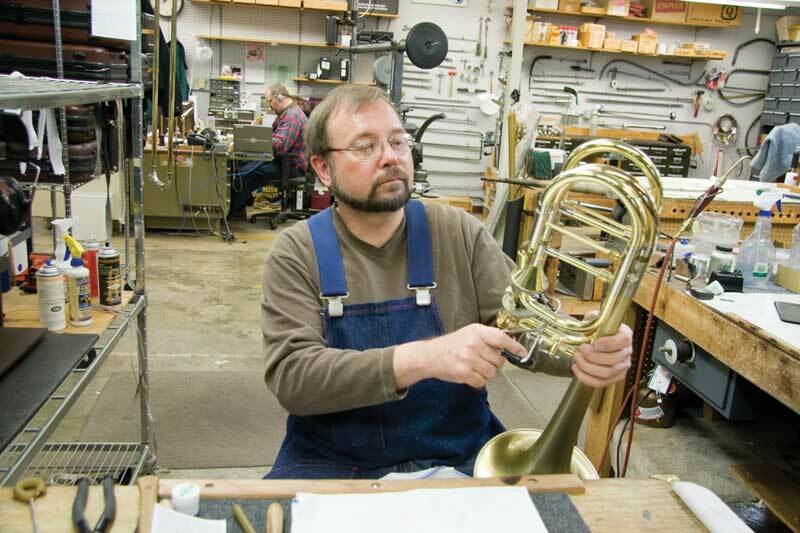 Scott Hayden, our lead brass technician, is retiring after 39 years of service here at Paige’s Music. When Scott joined me here in 1977 it was just the two of us doing all the repairs. Four shop remodeling’s and two moves later we now have a staff of 23 in the shop. Through all of the changes Scott has been instrumental in development, training, organizing and maintaining the level of repair we believe in, as well as one of the finest brass technicians I know. We wish him well in this new chapter of his life as he and his wife, Mary Lou, get to enjoy their grandkids and traveling at their leisure. You can learn more about Scott from his Staff Spotlight that we recorded back in February of this year (2016). I've known Scott for a long time and know he is a very talented musician and a remarkable person as well. He spends a great deal of time volunteering and offering his skills to help others. I also have purchased three instruments from Paige's, upon the recommendation of our school's music instructor, and know the company to be of the highest caliber. Congratulations, Scott, on an excellent career. Enjoy retirement!